Welcome to Jodhpur - contd. The 5 km long majestic fort on a 125 metre high hill is one of the most impressive and formidable structures. Although invincible from the outside, the fort has four gates approached by a winding road. 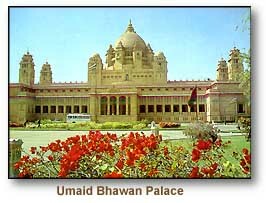 Within the fort are some magnificent palaces with marvelously carved panels , latticed windows and evocative names. Not worthy of these are the Moti Mahal, the Phool Mahal, the Sheesh Mahal, the Sileh Khana and the Daulat Khana. These palaces house a fabulous collection of trappings of Indian royalty including a superb collection of palanquins, elephant hawdahs, miniature paintings of various schools, musical instruments, costumes and furniture. These colourful markets with tiny shops dotting the narrow lanes are situated in the heart of the city and are popular for a wide range of handicrafts, making them the favorite haunt of shoppers. The museum has an exquisite ensemble of paintings, sculptures and antique weapons. Balsamand Lake and Gardens (5 km) : A pretty lake built in 1159 A.D. A splendid summer Palace stands by the lake side surrounded by beautiful gardens. An idyllic spot for excursions. 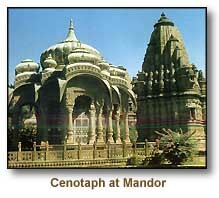 Mandore (8 km): The ancient capital of Marwar has cenotaphs of the Jodhpur rulers. The Hall of heroes has fifteen figures carved out of the rock on the wall which represent Hindu deities. Its beautiful gardens with high rock terraces make it a popular picnic spot. Mahamandir Temple (9 km): Built in 1812 A.D. it is noteworthy temple with 84 carved pillars. Osian (58 km): An oasis in the desert, situated on the diversion off the main Jodhpur-Bikaner Highway. A drive to this ancient township takes one past undulating terrain,punctuated by desert stretches and little hamlets. Osian has 15 beautifully sculptured Jain and Brahmanical temples. Of these the most outstanding ones are the earlier Surya or Sun Temple and the later Kali temple,Sachiya Mata Temple and the main Jain temple dedicated to Lord Mahavira. Dhawa (45 km): A wildlife sanctuary with the largest number of Indian antelopes. Nagaur (135 km): An imposing fort with beautiful murals. It is also the venue for a beautiful murals. It is also the venue for a week long cattle fair held in Jan/Feb every year. 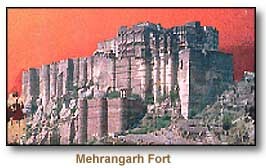 Rohit Fort (40 km): Now a heritage hotel, the fort is worth a visit. Luni Fort (20 km): Now converted into a heritage hotel, this fort and its surroundings are worth a visit.